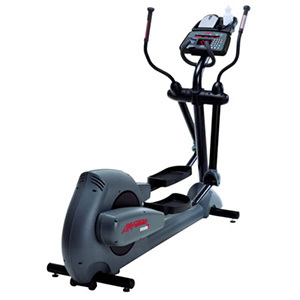 Life Fitness Elliptical 9500 Next Gen. The Life Fitness 9500 Rear Drive Cross Trainer is one of the top elliptical choices for the world’s top facilities: from high-traffic health clubs to the armed forces and athletic training centres. The Life Fitness 9500HR model features the exclusive Lifepulse™ digital heart rate monitoring system–the most accurate way to calculate individual heartbeats. This Life Fitness total body Cross-Trainer combines the cardiovascular/muscular benefits of running and the low impact of walking. Work large groups of upper and lower body muscles at the same time. Alternate between forward and backward motion for total body results. Life Fitness Lifepulse™ digital monitoring system is nearly as accurate as a clinical EKG.